Centaurus A (NGC 5128), is a radio galaxy about 10-16 million light years from Earth. The image above is a newly released composite view of the powerful jets created by the galaxy’s massive black hole. The image combined three sets of observations. X-rays (colored blue) from the Chandra X-ray Observatory, submillimeter data (colored orange) from the Atacama Pathfinder Experiment (APEX) telescope in Chile and visible light data from the Wide Field Imager on the Max-Planck/ESO 2.2 m telescope. The jet in the upper left extends about 13,000 light years away from the black hole. 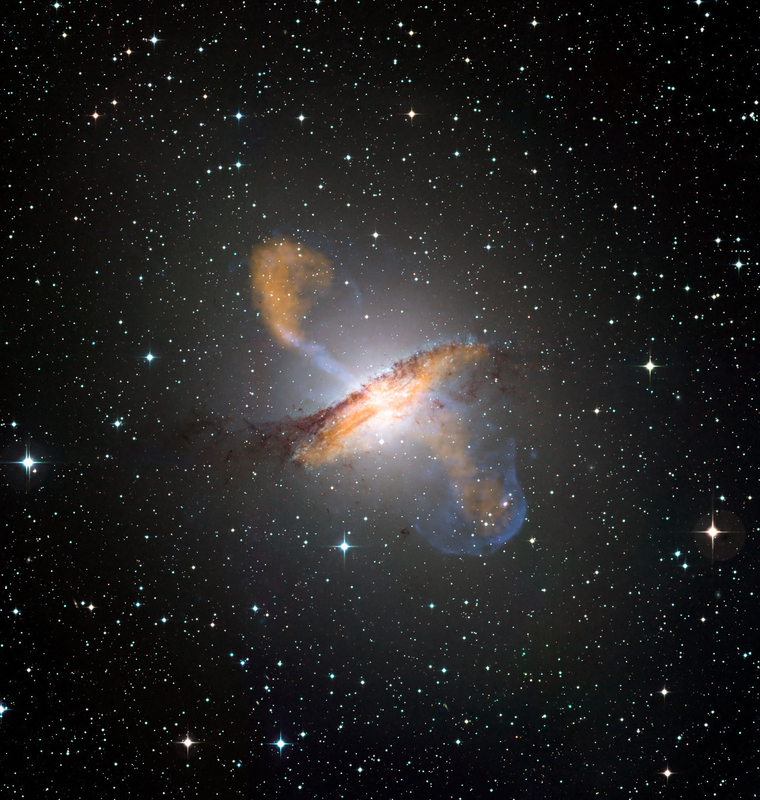 This entry was posted in Astronomy, Cosmos, European Space Agency, Galaxy, Jet Propulsion Laboratory, NASA and tagged APEX, Atacama Pathfinder Experiment, Black Hole, Centaurus A, Chandra X-Ray Observatory, ESA, ESO, European Southern Observatory, European Space Agency, JPL, Max-Planck Observatory, NGC 5128. Bookmark the permalink.